With cold weather pressing in on Northern Colorado, you’ll quickly learn what condition your car battery is in, since a battery that’s nearing the end of its life has a harder time starting your car the colder it gets. To prevent the inconvenience of being stranded with dead car battery – not to mention paying to replace it – follow these tips to prolong car battery life this winter and all year round. As with most things, car batteries work better when they’re clean. Corroded terminals block the current from flowing between the battery and the cables, making it difficult for your car to start. Scrape away minor corrosion with a screwdriver or pliers to help keep the current flowing. This is even a useful tip for bringing a “dead” battery back to life. 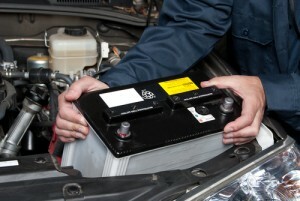 Check your battery every time you check your oil to make sure it’s securely in place. Excessive vibrations from a loose battery can damage the plates. Check the battery terminal connections as well to make sure they’re tight. Loose connections can cause the battery to break down sooner. It may not seem as though a dirty casing could have any bearing on battery life, but dirt and other gunk that collects here can actually drain battery power. This makes it harder to start your car in cold weather, especially if you haven’t driven it for a couple of days. Fortunately, there’s a simple fix for this problem: just wipe the casing off with a damp rag to keep it clean. If you have a close by errand you need to run, consider walking or riding your bike instead of driving the car. Short trips tax the car battery because you ask it to start the car and then drive for only a minute or two before turning the car back off. When the weather’s cold and biking or walking isn’t an option, leave the car running if you only need a minute to drop off or pick up something from the neighbors’ house. Simple plastic insulating blankets are available for car batteries. Their purpose is to help keep the battery warm on cold nights and cooler on hot days. By helping the battery sustain a more moderate temperature in all conditions, an insulating blanket can greatly extend car battery life. You just need to install a small enough battery that there’s room in the engine compartment to wrap it up. The main purpose of the battery is to start the car. Once the engine’s running, it recharges the battery. However if you leave the interior lights, headlights or radio on for an extended period of time while the car is off, the battery will drain and make it more difficult to start your car next time. Plus, the continual draining and recharging may shorten car battery life. When a car sits for weeks or months without being driven, the battery slowly loses its charge. If your college-age child left her car at your house while she’s off at school, start it up and take a spin around the block a few times a month to prevent being met with a dead battery once she gets home. Every time you bring your car in for service at Scott’s Fort Collins Auto & Repair, have the battery charge rate checked. Both under and overcharging the battery reduces its life and voids the warranty. We can perform a free car battery check the next time you stop by to help you avoid any nasty surprises from a dying battery this winter. To take advantage of a free car battery check at Scott’s Fort Collins Auto & Repair, come in today! You can also schedule an appointment online or call ahead at (970) 682-4202.